A small and supportive group using quilting as a tool to explore Post-Traumatic Stress Disorder (PTSD). 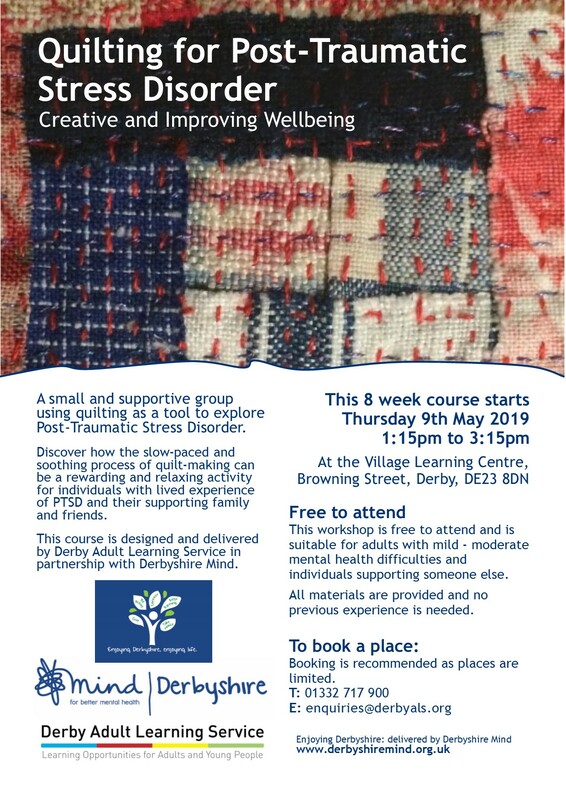 Discover how the slow-paced and soothing process of quilt-making can be a rewarding and relaxing activity for individuals with lived experience of PTSD and their supporting family and friends. This course is designed and delivered by Derby Adult Learning Service in partnership with Derbyshire Mind. This workshop is free to attend and is suitable for adults with mild – moderate mental health difficulties and individuals supporting someone else. All materials are provided and no previous experience is needed. Booking is recommended as places are limited.